Why Do You Let the Sample Cool in a Dessicator? Sometimes a substance is more than the sum of its parts. In chemistry, interactions with the atmosphere can alter a compound and make it difficult to determine precise concentrations. Scientists rely on primary standard solutions to solve this dilemma. Primary standard solutions allow scientists to find the concentration of another compound. To perform well, a primary standard must be stable in air, water soluble and highly pure. Scientists should also weigh out a relatively large sample in order to minimize error. In chemistry, the term “primary standard” refers to a compound the chemist uses to determine the concentration of another compound or solution. For example, you can't ensure the concentration of a solution of sodium hydroxide (NaOH) by simply dividing the mass of NaOH by the volume of its solution. Sodium hydroxide tends to absorb moisture and carbon dioxide from the atmosphere; thus, a 1-gram sample of NaOH may not actually contain 1 gram of NaOH since the moisture and carbon dioxide content may impact the total. Instead, scientists use the NaOH solution to titrate a solution of potassium hydrogen phthalate (KHP) to use as a primary standard since KHP does not absorb moisture or carbon dioxide. A primary standard cannot decompose in, absorb or otherwise react with any components of air. Many iron(II)-based compounds, for example, react with oxygen in the air to become iron(III) compounds. Primary standards also cannot absorb water or other atmospheric components. 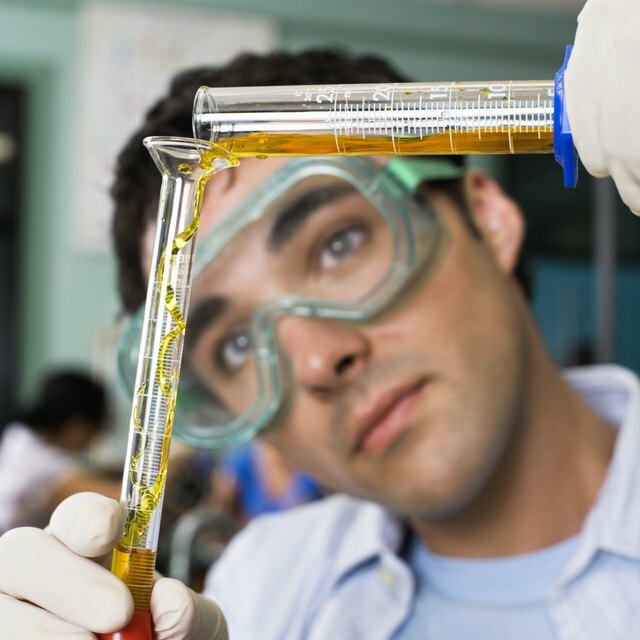 A chemist must be able to weigh a primary standard in air with a high degree of precision. Any absorbed moisture or other contaminants introduce errors into the mass measurements of the sample. Chemists almost always carry out reactions involving primary standards in aqueous solutions, which necessitates that the primary standard dissolve easily in water. Silver chloride (AgCl), for example, satisfies all of the other requirements of primary standards, but it will not dissolve in water and therefore cannot serve as a primary standard. The solubility requirement excludes a large number of substances from primary standard classification. Any impurity in a primary standard results in error in any measurement that involves its use. Primary standard reagents typically exhibit purities of 99.98 percent or greater. Note also that a compound that chemists use as a primary standard may not be primary standard grade. Chemists use silver nitrate (AgNO3), for example, as a primary standard, but not all samples of silver nitrate possess the necessary purity for this application. Compounds of high molar mass or molecular weight require relatively large sample masses for the chemist to carry out the standardization reaction on a reasonable scale. Weighing out large samples reduces the error in the mass measurement. For example, if a balance exhibits an error of 0.001 grams, then a measurement of 0.100 grams of the primary standard results in an error of 1 percent. If the chemist weighs out 1.000 grams of the primary standard, however, the error in the mass measurement becomes 0.1 percent. Brubaker, Jack. "Four Characteristics of a Primary Standard Substance." Sciencing, https://sciencing.com/four-characteristics-primary-standard-substance-8304038.html. 23 May 2018. What Is a Rubber Stopper?